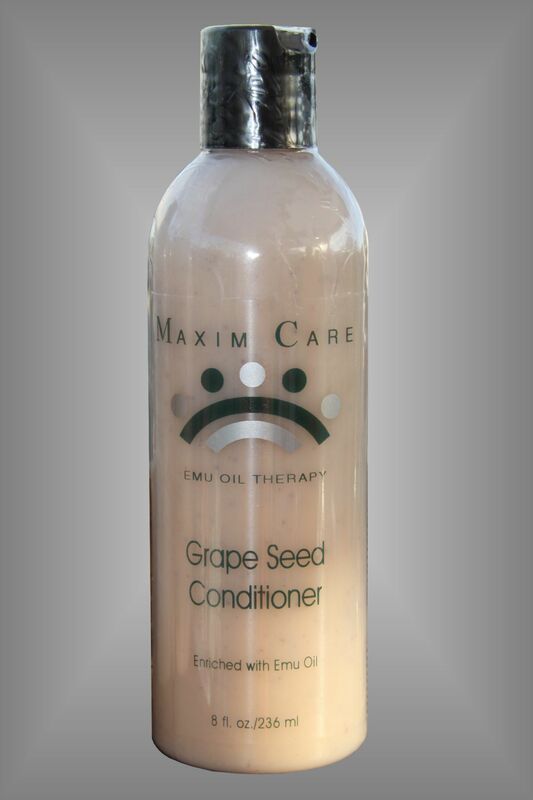 Maxim Care Grape Seed Conditioner is naturally formulated to replace natural oils as it protects and conditions your hair and scalp. Our special formulation is rich in nourishing EFA's, Emu Oil and the purest botanical extracts. Contains crushed grape seed extracts imported from France that work to gently massage and exfoliate build-up around the hair follicles removing dead cells which inhibit healthy growth. Our refreshing lemon-orange fragrance of our Maxim Care Hair Collection is aromatically designed to soften your mood, allowing you to unwind as you cleanse and condition your hair. This rich formula will not weigh hair down like most deep conditioners, it actually Adds bounce and a natural sheen to hair. Works great for color treated and permed hair. For the ultimate in hair and scalp health try our Moist - In Shampoo for beautiful, shiny, healthy hair. Directions: Apply a small amount of this concentrated formula to hair and massage into scalp. Wait 1-3 minutes and rinse with tepid water. Emu Oil, Deoiled Grape Seeds, Lactic Acid, Aloe Vera Extract, m MallowExtract, Chamomile Extract, Calendula Extract, Ginseng Extract, Comfrey Extract, DL Panthenol (Vit. B5), Germaben IIE, Essential Oil Blend.